Today, in its 50th day of release, Star Wars: The Force Awakens is expected to cross the $900 million mark at the domestic box office. It is the only film in history to reach this milestone. In addition, on Saturday (53rd day of global release), Star Wars: The Force Awakens is expected to reach the $2 billion mark worldwide, becoming only the third film ever to do so and just the second to do it in original release. Here's what Alan Horn, Chairman, The Walt Disney Studios, had to say in a statement about this milestone. "This is a historic moment for Star Wars, for Lucasfilm, and for Disney, and all of us here are extremely gratified to be a part of this journey with fans around the world who have made Star Wars: The Force Awakens such an extraordinary success. The film's achievements are truly astounding, and it's our great honor to relaunch this cinematic galaxy not only for all the devoted decades-long fans but for a new generation who will keep the Star Wars legacy alive for many years to come." Through February 4, Star Wars: The Force Awakens has earned an estimated $899.1 million domestically and $1,095.6 million internationally for a global total of $1,994.7 million. Opening internationally December 16 and domestically December 18, Star Wars: The Force Awakens posted the all-time biggest global and domestic debuts with $528.9 million and $247.9 million respectively. Over the course of its eight-week run, it has set numerous other records, including biggest domestic preview gross ($57 million) biggest opening day domestically ($119.1 million), biggest domestic second weekend ($149.2 million), biggest domestic third weekend ($90.2 million), biggest opening week domestically ($390.8 million), biggest opening weekend in 18 territories: U.K. (4-day), Australia, Russia, Germany, Sweden, Norway, Finland, Austria, Poland (3-day), Denmark (5-day), Romania, Hungary, Bulgaria, Croatia, Ukraine, Iceland, Serbia, New Zealand, fastest film to $1B globally (12 days) and it's the biggest film of all time in the U.S. and the U.K. Directed by J.J. Abrams, written by Lawrence Kasdan & J.J. Abrams and Michael Arndt, and produced by Kathleen Kennedy, J.J. Abrams and Bryan Burk, Star Wars: The Force Awakens was named one of AFI's top ten films of 2015 and has received five Academy Award nominations, for film editing, visual effects, sound editing, sound mixing, and for series composer John Williams' original score. The Star Wars Saga continues December 15, 2017, in Star Wars: Episode VIII, picking up in the wake of Star Wars: The Force Awakens. Later this year, Rogue One: A Star Wars Story, a new adventure detailing events prior to Star Wars: Episode IV - A New Hope, takes flight on December 16, 2016. Star Wars: The Force Awakens is now just behind Titanic ($2.1 billion) and Avatar ($2.7 billion) at the global box office. It remains to be seen how long Star Wars: The Force Awakens will remain in theaters, so we'll have to wait and see if it can surpass both of those movies, or possibly become the only movie in history to make $1 billion domestically. 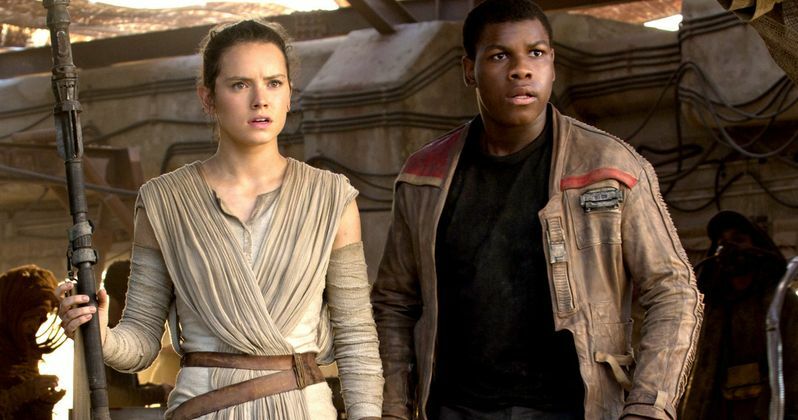 Do you think Star Wars: The Force Awakens has a shot at breaking Avatar's global box office record?